To increase understanding of school meal nutrition standards. To increase support of school meals. To understand perceptions of and priorities for school meals. To generate new ideas for nutritionally sound, compliant, and delicious school meals. Missed the April 2018 Reimagining School Meals Event? Check out the video below! Learn more about our April 2018 Reimagining School Meals Event! North Carolina’s traditional public schools are required to participate in the National School Lunch Program but the state provides very little funding for school meals. Most of their funding is coming from federal reimbursements and the reimbursement rates for free, paid and reduced-price meals are relatively low. The state provides a reimbursement of $0.30 per reduced price breakfast. School nutrition programs have to operate independently from the rest of the school system. They have to operate essentially as a private business. They are expected to cover all their expenses including the cost of food, labor, and indirect expenses such as water, which they pay to the school system itself. For a reimbursable school meal, schools must offer a serving each of a meat or meat alternative, a grain, a vegetable, a fruit, and milk. Children must select three items, and one must be a fruit or a vegetable. As of December 2017, 869,954 children ate school lunch in North Carolina. 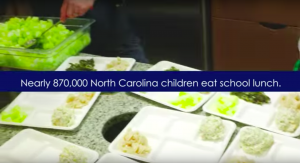 This makes North Carolina the seventh largest school nutrition program in the country. In 2017, preliminary data shows the National School Lunch Program made payments totaling $387,928,245 to North Carolina but this is not enough to provide the meals our children deserve. Statewide 59.82% of children in North Carolina public schools were eligible for free or reduced priced lunches. Kids who qualify for free or reduced price meals get about 50% of their calories from school meals. Read More about School Meals! Do Healthy Meals Improve Student Test Scores? Can Free Breakfast Improve Learning? Are We Having the Wrong Conversation about Student Achievement?